Power wheel chair for sale, excellent condition, hardly used due to being in hospital. This is perfect for folding into cars. Comes in teal. Seat width is 18inches. 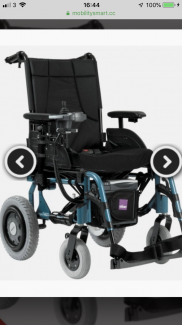 Incredibly lightweight and easy to transport, the Esprit Action 4NG Power Wheelchair delivers all of the benefits of a standard power wheelchair without the added size and bulk. Ideal for those who like to get about easily, it offers incredible manoeuvrability with the ability to navigate even the tightest spaces. The wheels can be detached without the need for any tools and they also have a self-propel option if desired. For the highest levels of convenience, this chair is designed with the motors sitting on the inside helping to reduce the overall width for a more sleek look and feel. It can be dismantled with the utmost of ease making it simple to store and transport. 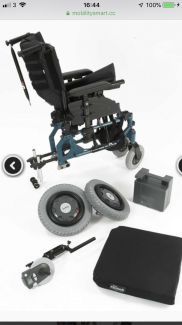 Created to allow for configurable options that you would normally only expect in a manual chair, the Esprit Action 4NG Power Wheelchair also incorporates the powerful drive wheels discreetly into the hub to maximise its slender frame. Highly adjustable, it can be altered to suit the individual meaning that your chair will meet your every need.